I do have a mini update on my blanket :D Tonight is Doctor Who night. I always forget on Sundays so I sit and watch it Monday evening on ABC iview. I like doing it this way as I can watch it when I can not when they say I can. I had my first of 2 exams today and I think I did alright. I know I did the best I could so I am enjoying a little rest before jumping into the crazy tomorrow to prepare for my next exam. My blanket is getting much bigger but I'm probably only a third of the way. I really would love a nice big blanket but we shall see how that goes as I continue to expand the blanket. I like a blanket that you can really curl up under. I have 8 more balls of yarn so that should be enough to make it a decent size. I am thinking though that after this lot of repetitions that I will halve the amount I use of each colour so only 3 rows instead of 6. Not sure... will have to think about it when I get there. Still two more colours of 6 to go before I have to think of that. 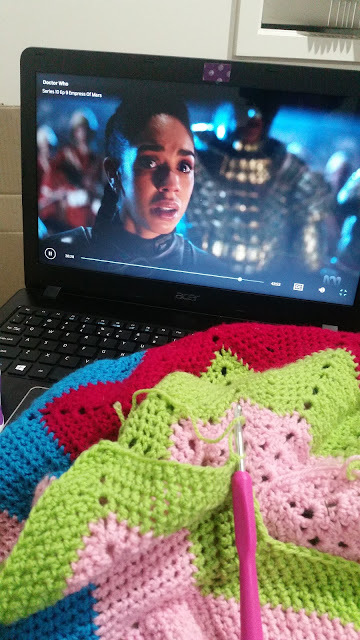 For more information about the pattern I'm doing you can go to my previous post here. Have you ever made a blanket like this? It's taking me ages and unfortunately each round takes longer and longer to complete. Though MAYBE this will be completed before the end of winter this year..... but I'm not holding my breath! Good luck on your exams. Your blanket is looking fabulous! Thank you :D It's always hard because I talk myself around in circles, don't we all? I am sure you did great on your exams but I am sending you a little extra luck! 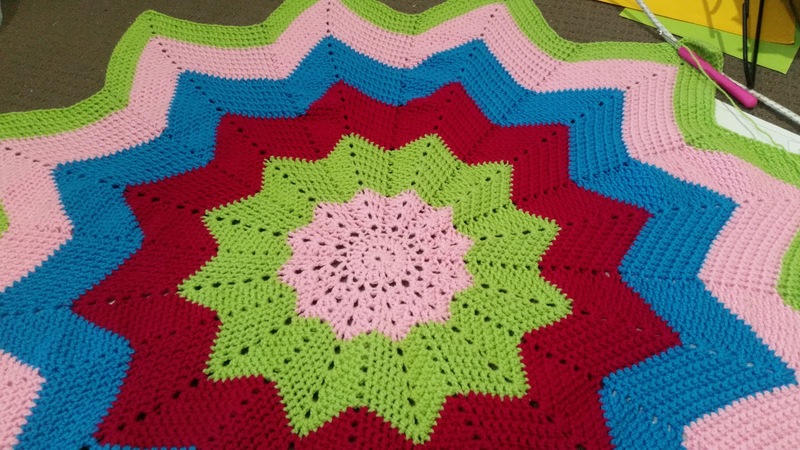 I just LOVE how the blanket is turning out!